As Apple’s iPhone celebrates its sixth(!) birthday today, the pioneering smartphone has carved out a solid market position, and a demographically distinctive user base, within the ever-expanding world of smartphones (which, according to the Pew Research Center’s Internet & American Life Project, more than half of Americans now own). The iPhone is, along with Google’s Android, one of the two dominant smartphone platforms in the United States. 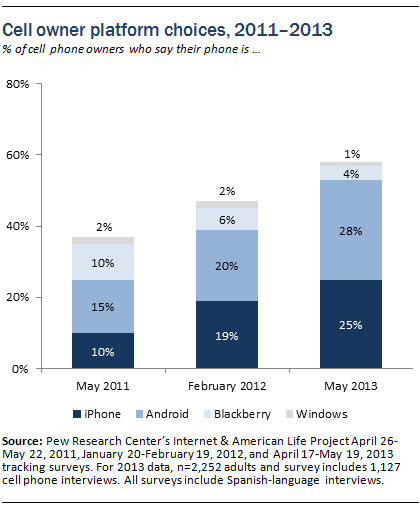 As of May 2013, according to a recent Pew Research Center report on smartphone ownership, 25% of all U.S. cellphone owners– and 43% of smartphone owners — own an iPhone, a few percentage points behind Android. Other smartphone platforms — Microsoft’s Windows Phone, the fading BlackBerry, the handful of Palms still in use — are far behind. There had been smartphones before Apple launched its first-generation iPhone on June 29, 2007 (the Simon Personal Communicator from IBM had a brief, unsuccessful life in the mid-1990s), but the iPhone’s big touchscreen, ability to add apps and overall usability are widely credited with making smartphones mass consumer items. The Pew Research survey found that more-affluent and more-educated people are much more likely than those with less income and education to say they own an iPhone. Indeed, fully half—49%—of cellphone owners with household incomes of $150,000 or more say their phone is an iPhone, as do 38% of owners with college degrees. And while Hispanics and non-Hispanic whites were about as likely to say they owned an iPhone as an Android phone, only 16% of black cellphone owners said they went with Apple, versus 42% who said their phone was an Android.